Ódú, aka Sally Ó Dúnlaing, is an Irish singer songwriter who crafts sonic heartbreak packaged in a glossy sheen of danceable pop. Born in New York and raised in the Irish seaside town of Bray, Ó Dúnlaing's Conversations EP is the singer's first foray into putting her music on record. After a period of time spent questioning whether she was good enough or young enough to go through with releasing this EP, a dilemma which is documented in the defiant magnetism of opener "Feed You Lies", Conversations eventually came to fruition late last year. There's a sugary sweet quality to the lush synth arrangements that glue this EP together, that offsets Ó Dúnlaing's instantly commanding vocals. The pulsing electric drums on "Time" are punctuated by a synth that sounds a spaceship beaming someone up, as Ó Dúnlaing instructs, "I will call on you when I need a helping hand/ But our paths will only cross when I command." "Silent" is a woozy, dream-like offering that snakes through adoration and desperation as Ó Dúnlaing sings, "I'll always be your biggest fan/ Love me", alongside the irrepressible sense of defiance that is a constant throughout this EP. 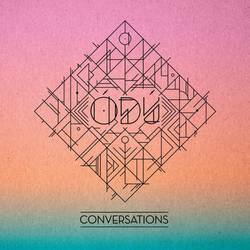 Conversations deals with a swathe of emotions, from insecurity on "Feed You Lies" to infatuation on "Silent", with bright, buzzing electronic soundscapes creating an uplifting, kaleidoscopic bubble like all the best pop music does. More of this, please. Posted Jan. 30, 2017, 5:22 p.m.